Today would’ve been Granddad’s 100th Birthday. I’ve thought about him throughout the day today, scrolling through many wonderful memories. One of my recent favorites was the day he threw out the first pitch at a Royals game. It was September 2010, and as the oldest Eagle Scout in the Midwest, he was the lucky man who got to go out on the mound and throw the pitch. He was so happy that day, with 4,800 scouts there to celebrate with him, along with his family. 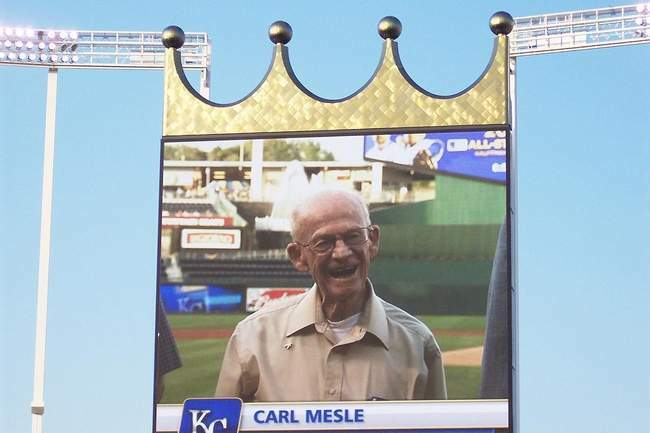 So here is a photo of him on the big screen, smiling ear to ear, in honor of the Royals’ incredible third win against the Orioles tonight, and in honor of his (almost) 100th birthday. Big hugs, Granddad. We will miss you always. This entry was posted in Family and tagged Carl Mesle, Eagle Scout, family, First Pitch, Happy Birthday, Royals. Bookmark the permalink. Wonderful, Meg! I, too, thought about him all day and told people about him. He was pretty special. Love you.